The physical human brain can be thought of as separate parts, even though technically, they work together as a whole. Most of the top of the structure is what is called the forebrain. 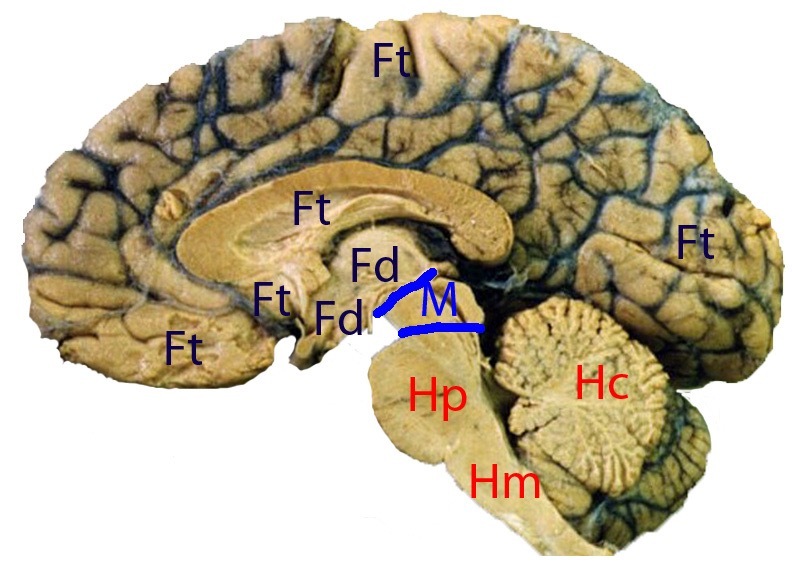 The forebrain is made up of the diencephalon (Fd) and telencephalon (Ft). Beneath the forebrain is the brain stem consisting of the midbrain (M) and hindbrain, which is made up of the pons (Hp), cerebellum (Hc) and medulla (Hm). Connected to the brainstem is the spinal cord. The forebrain and brainstem are contained within the skull, and is connected to the spinal cord through an opening called the foramen magnum. The spinal cord is housed in the vertebral column. Each of the four brain functions of Voluntary movement, Perception, Homeostasis, Higher abstract functions can be mapped to the physical anatomy of the brain. The voluntary movement function is controlled through motor neurons contained in the brainstem (facial and head movement) and spinal cord (limbs and trunk movement). There are fewer than 100,000 of these neurons, compared to the total approximate 85 billion neurons in the body. If one of these motor neurons dies, the movement it controls becomes disabled. Perception is processed in the cerebral cortex which covers the outside, squiggly surface of the forebrain. Homeostasis is a distributed process and happens in the forebrain, which is responsibile for hormonal changes and the brain stem and spinal cord, both controlling automatic and conscious movements. Higher abstract functions or cognition, depends fully on the forebrain. It is said that if only the forebrain were kept alive, cognition would still occur without the brainstem or spinal cord. While perception is an abstract function, it can also be viewed separately. Knowing these differences can help us protect the brain better from damage. Any impacts to the spinal cord and brain stem can affect motor movement and cause disablement or paralysis while impacts to the forebrain can affect cognition. People who are active in high-risk sports should take extra care to wear safety gear to ensure they avoid damage to these sensitive areas. Parents, guardians or educators who work with children also have to be aware of activities that pose a risk to the head or spine and take precautions to reduce potential for accidents. Let's take good care of our brains. We still need them. I am very much pleased with the contents you have mentioned. golaya progressive public school I wanted to thank you for this great article.